The wave count was invalidated with downwards movement. I was too quick to label the C wave of the triangle as complete. Overall the wave count remains the same. Minor wave B still looks like it is unfolding as a regular contracting triangle. Within the triangle minute wave c now has a better more typical look, and so with this anlaysis I am more confident it is finally over. Minute wave c is now an 82% correction of minute wave b which is a very typical length and gives the triangle the “right look”. This wave count now expects more upwards movement to complete minute wave d as a single zigzag. Minute wave d may not move beyond the end of minute wave b above 22.224. If minute wave c continues lower it may not move beyond the end of minute wave a at 18.585. Overall this wave count expects to see very choppy, overlapping sideways movement for a few weeks yet in an ever decreasing range. The structure of minute wave c is complete and looks clearly like a “three” on the daily chart. Within minute wave d no second wave correction nor B wave may move beyond its start below 19.232. Hi Lara. 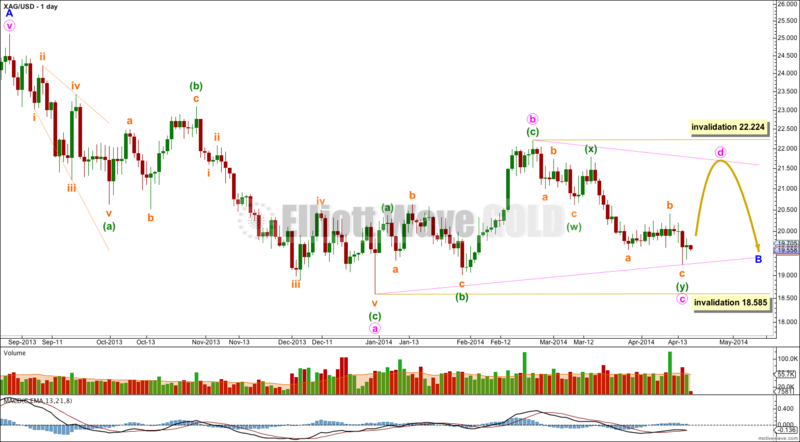 Similar to your alternate count for gold in which you have shown a double zigzag, I am wondering if silver also has a similar structure as shown in the picture file attached. Minor A is at 25.12. The first zigzag, Minute W (which is a 5-wave impulse), terminates at 18.72. The connector, Minute X (which is a 3-wave impulse), terminates at 22.18. 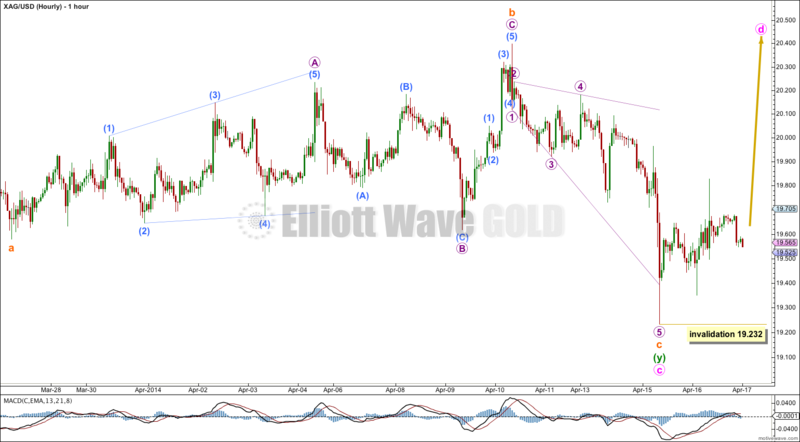 The second zigzag, which precedes gold’s, is a 5-wave impulse structure. Minuette waves 1 (ending at 20.61), 2 (ending at 21.80) and 3 (ending at 19.22) have completed. We are now into Minuette Wave 4 which could have ended at yesterday’s high of 19.82 for a 0.236 Fibonacci relationship with Wave 3 (unless it continues higher to 20.22, at Fib 0.382 which is the normal ratio for Wave 4). Wave 5 (which is also Minute Y and Minor B) will reach 18.27 (if Wave 4 = 19.84) or 18.65 (if Wave 4 = 20.22). All prices are based on StockChart’s. For your consideration please. This is not to detract from your fine analysis work which I greatly appreciate for its accuracy. Overall the idea is entirely valid, yes. But the way you are describing it has some problems. What you are suggesting is that minor wave B may be an incomplete combination or double zigzag. This is possible. Within a double zigzag or combination all the subwaves of W, Y (and if there is one, Z) can only subdivide into simple A-B-C corrections. They cannot be five wave impulses as you suggest minute wave w to be. Minute wave x cannot be a three wave impulse, impulses are made of five waves and X waves can only be corrective structures. Impulses are not corrective structures. Your idea is entirely valid, but your understanding of how multiples subdivide is not. You may find the videos on my education page of some use. Just remember; W, Y and Z can only subdivide as simple A-B-C corrective structures. X can be any corrective structure. Double zigzags and double combinations are quite different; the purpose of a double zigzag is to deepen a correction when the first zigzag does not move price deep enough. So their X waves are normally shallow and the second zigzag moves price beyond the end of the first zigzag. 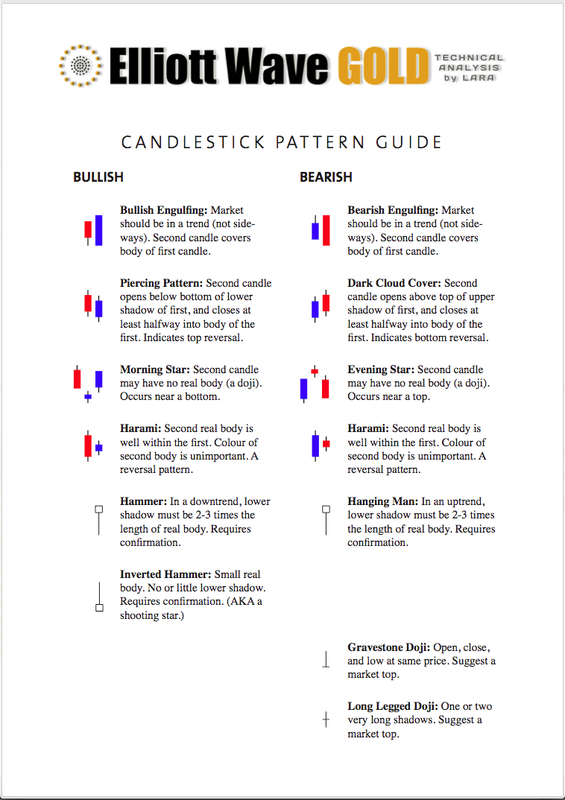 Double combinations have the purpose of moving price sideways and taking up time, so their X waves are normally deep and the second structure in the combination normally ends about the same point as the first structure (often slightly beyond, but not significantly). Hi Lara. Thank you for your enlightening comments. I sure learned a lot from this. Still pursuing the same theme, what if Minor B is a single zig-zag divided 5, 3 and 5. Then instead we will have Minute A (instead of W), Minute B (instead of X) and Minute C (instead of Y). I reckon this complies with all the Elliott Wave rules. That would expect new lows below 18.585 as most likely. It would have to see minute wave a down as a five, which is entirely possible. The reason why that is not my wave count is there is almost no room left for downwards movement. 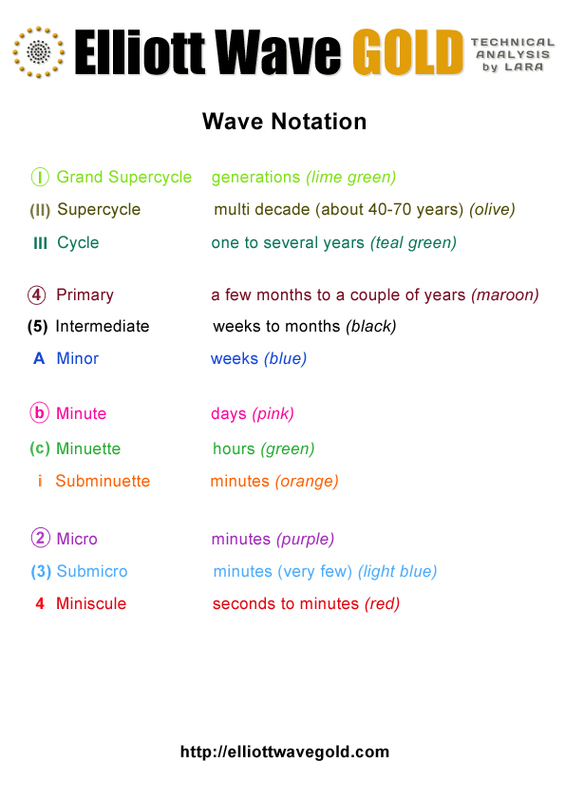 If minor wave B is an incomplete zigzag, and minute wave c within it nearing it’s end, then it is most likely to move below the end of minute wave a at 18.585 to avoid a truncation, but it cannot move below the start of minor wave A (because minor wave A is a five) below 18.215. That’s not a lot of room to move into.